We get up, eat some pasta and before sunrise we get to the gathering point in front of the parliament. From there the buses take us to the town of Marathon, to the local olympic stadium. I drink some tea in a small café before I enter the overcrowded stadium. We are in the very last starting block. That is because we didn’t have any reference time from a previous marathon in order to be sorted into one of the blocks closer to the starting line. There is a colorful variety of people around us from all over the world, from apparently well-trained to people from presumably Weight Watchers, where you wonder how they are going to finish. Jack has over half a kilo of sports food taped to his arms and legs, since he doesn’t have any pockets. He is prepared for all contingencies. I only have 2 or 3 power gels and aspirin in the back pocket of my shorts. We finish the drinks we took with us and go for the last time to the restroom. Nobody wants to lose time on physiological necessities during the run. The atmosphere gets hot with every minute and finally the blocks are starting one after another. At 9:15 our last block comes to start and up we go. The pulse goes up immediately after so much waiting and excitement, but we stabilize quickly and have trouble keeping down our speed to 6min/km, as we assumed to run. We go down to 5:40, sometimes 5:20 in the first kilometers, carried on the wings of freshness, on the wave of the adrenaline push. From the very beginning we take over hundreds and hundreds of people. We chat with each other, we chat with people around. There is an endless stream of people to be taken over. We run like on a fast lane with 6min/km, apparently much faster than most of the people around us. This gives us a good feeling and additional power. Only a few pass by us. We drink on every food station and eat according to our plan using our own food and the food provided by the organizer. 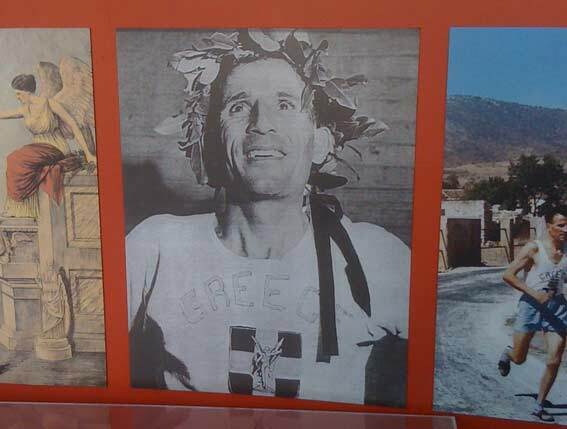 The Athens classic marathon is feared by its profile. It’s pretty hilly which it keeps it from appearing in the finishing time comparisons for normal marathons. There is a long ascent between km 17 and km 32 with several short but sharp valleys in-between. Our speed drops to 7min/km and more but we are overtaking people by hundreds all the time. We reach half-distance (21km) in very good shape. Apparently too good for Jack, since he decides to speed up a little bit. I decide to keep the pace since there are 21km to go. In my final test I have run 32km and I know you can break in suddenly after 25km so it’s better to save your energy for the last 10km. Jack has done maximum of 25km in his preparation so he is lacking the experience (or maybe the imagination) to be wary about this problem. I lost him from the sight for a while but I catch him up around km 28. He is seemingly worn out, I slow down and we keep going together. There is only 4 km left to the hill summit. We keep observing our speed, and looking more and more intensively for the distance flags, which mark the course every kilometer. Our speed drops to 7:30km/h at that point. We start to feel our muscles and Jack starts complaining about a blister. Finally we reach the summit at km 32 and the descent begins. Jack says with a smile: “only 10km to go, just one hour and we are home”. My answer: “If I had told you 3 months ago that you will say this to me on km32, you would call me crazy”. Jack laughs with understanding. This situation seemed so unrealistic just 90 days ago. 3 months of preparation and there we are. We have changed our reality, our perception of the world. Now the seemingly easy part, gentle descent to the finish in Athens. We speed up. We know, if we can keep the speed for the last 10km, we will reach our time goal. No stress, just keep going. Only an injury or collapse can stop us now. We are running through the suburbs, masses of people on the street side. Emotions rising with every minute. I feel like in a trance, with a tunnel vision directed to the front, towards an imaginative finish. I start to feel dull pain in the ankles, knees and also hips but the fresh adrenaline I am showered with allows me to ignore the pain graciously. I also ignore the view of injured or stretching runners at the street side, runners who gave up or are taken care of by the medical stuff. On km 42 I see a well-trained runner with a circulatory collapse lying on the crossing. A tragic view. 2 km prior to the finish he fall out. But we keep going. Time for the energy gum, which dissolves in the mouth getting the energy directly through the mucous membrane into the blood. The final energy push for the finish. I promised Jack to keep his slower speed until the stadium, since he is limping a little bit due to his huge blister. The last street down the hill before the stadium and we are there. I start to sprint setting myself off from Jack and overtaking several runners on the very last meters. We are there, finishing time 4:28. What a feeling! We get the finisher medal and move to the resting are. We are in the legendary marble stadium built for the first olympic games of the new era. It has a form of a horseshoe and is filled with thousands of frenzy applauding people. What a moving moment! I notice Jack turning his back to me. I think maybe he is offended because I sprinted, but we agreed on sprinting in the stadium. He turns back with tears in his eyes. He is crying with happiness and he feels ashamed of crying in front of me. This is definitely a major achievement in our lives. Maybe the first on our conscious quest to excellence. We take some pictures, eat and drink something in the catering area and proceed to the changing area. Jack is completely wasted so he takes a rest. I go to get our changing sacks. When I come back I can see Jack lying on the grass, eyes closed and a smile of endless happiness like a buddha. The day before we were visiting the museum of marathon. And there was a picture of the first marathon winner, radiant with happiness after his victory. This guy looked in comparison to Jack as if a person nearest to him just died. Jack was so wasted he had trouble to descend the curb. He needed half a minute to find a way to do it avoiding pain as much as possible. The biggest lesson I have learned that day: In July 2010 running a marathon was impossible for me. It wasn’t just a limit of my mind. It was objectively impossible for my body at that time. But I learned that, after 3 months of preparation, an impossible thing can become not only possible, but even absolutely doable. This rule applies to all the aspects for our lives and will guide me for the rest of my life. With enough time and preparation we can achieve much more we think is possible and certainly more than it is possible for us now. Some of you may say: “yes, with enough time”. But let us the necessity of time investment not stop us from achieving our dreams. The time will pass anyway, the only difference is, if we will have the result achieved at the end or not. What do you think about it? Your comments are welcome.